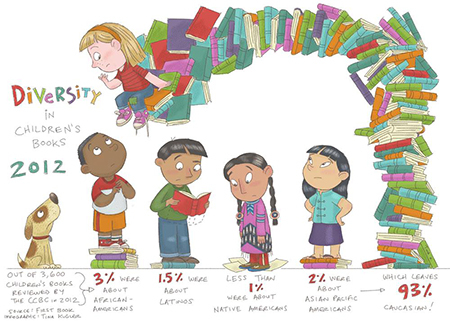 This beautiful illustration by the talented Tina Kulger, inspired by data collected in the most recent study from the Cooperative Children’s Book Center, has brought renewed awareness of the troubling reality of underrepresentation of African-American, Asian, Native American, and Latino/a characters in children’s books. What can or necessarily should be done with this knowledge has been the subject of much debate. Brooklyn author and illustrator Christopher Myers posted an excellently penned essay on the matter in Horn Book Magazine. In it he argues that literature “allows us a bird’s-eye view of our own lives, and especially how our lives relate to those lives around us” and reminds us of the power of books to favorably shape how our encounters of “others” will transpire in real life. ISA'S STORY: I tutor because I was one of those kids too.